Flawless editing in OS® XGenerate flawless audio files with Sound Forge™ Pro Mac. New features include in-depth metering utilities, top-tier vocal processing, and the freestanding Convrt™ Batch Processing Automation Tool. Seamless integration with SpectraLayers™ Pro 2 provides the finishing touch, delivering the ultimate in waveform and spectral editing program integration. 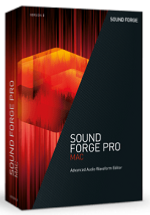 Employ Sound Forge Pro Mac in your studio workstream and open smooth new pathways to audio excellence in OS X.